Electronic health records can provide many benefits for providers and their patients, but the benefits depend on how they're used. Meaningful use is the set of standards defined by the Centers for Medicare & Medicaid Services (CMS) Incentive Programs that governs the use of electronic health records and allows eligible providers and hospitals to earn incentive payments by meeting specific criteria. For details about the incentive programs, visit the CMS website. The Medicare and Medicaid EHR Incentive Programs are staged in three steps with increasing requirements for participation. All providers begin participating by meeting the Stage 1 requirements for a 90-day period in their first year of meaningful use and a full year in their second year of meaningful use. After meeting the Stage 1 requirements, providers will then have to meet Stage 2 requirements for 2 full years. Eligible professionals participate in the program on the calendar years, while eligible hospitals and CAHs participate according to the federal fiscal year. 15 core and 10 menu set objectives. You have to select 5 out of 10 menu set objectives. Choose 6 out of 44 quality measures. 17 core and 6 menu set objectives. You have to select 3 out of 6 menu set objectives. 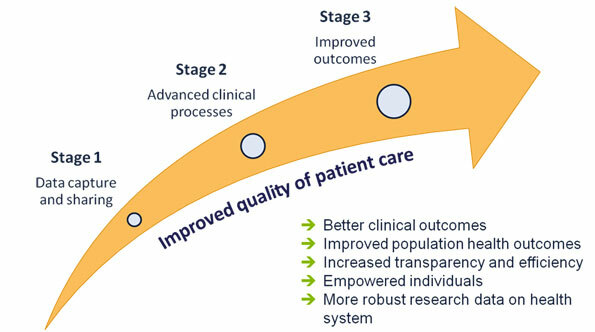 Choose 9 out of 64 quality measures. The percentage(%) denotes the % of all unique patients for whom the criteria should be fulfilled.